When I moved to Brooklyn Heights in 1983, one of the principal attractions the neighborhood held for me was that it sat atop a bluff overlooking what were then working piers serving breakbulk cargo ships, mostly in the South American trade, where ports were just beginning to develop container facilities. At the crest of the bluff, cantilevered over the Brooklyn-Queens Expressway, is the Promenade, a walkway extending for about half a mile, shown below. The Promenade commands a view of the piers below, the East River (actually a strait connecting upper New York harbor to Long Island Sound), and beyond, the Statue of Liberty, Lower Manhattan and the Brooklyn Bridge. Here is a view from the Promenade looking toward the South Street Seaport on the Manhattan side, with the Woolworth Building on the left and the Municipal Building (once described as "the most outstanding example of Stalinist Gothic architecture in America") to the right. Note the Danish sail training ship docked at the end of Pier 17. Unfortunately, shipping economics scotched my dream of living in a place overlooking working docks, as, shortly after I moved, the neighborhood paper announced the closing of the piers below the Heights. The triumph of containerization meant that piers without many acres of storage space in front of them were obsolete. For several years, the piers were used as parking spaces for ships awaiting sale to new owners or for scrap, including a former Matson liner that ended its years of service as part of the Chandris cruise fleet, a World War II vintage C-4 type freighter that had been converted to a container ship, and the battleship Iowa, which had been reactivated and was awaiting permanent port facilities on Staten Island (Iowa was later withdrawn from service and the Staten Island base canceled). After a few years, buildup of silt around the piers precluded even their being used for this purpose. The City now intends to turn the piers, and the land between them and the Heights, into a waterfront park. 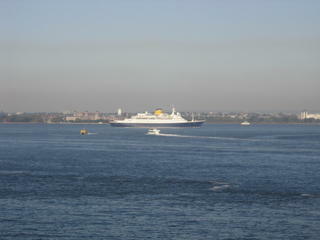 Despite the loss of the piers, the Promenade is still a good location for ship watching. 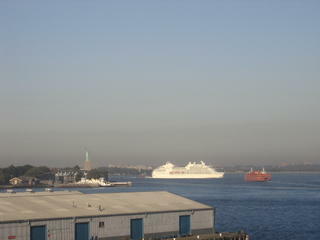 On Saturday mornings and evenings through late spring, summer and early fall, a parade of cruise ships can be seen entering and leaving port. On occasion, cargo vessels sail right by the Heights, entering or leaving the East River en route to docks at the former Brooklyn Navy Yard, or to ports on Long Island Sound. 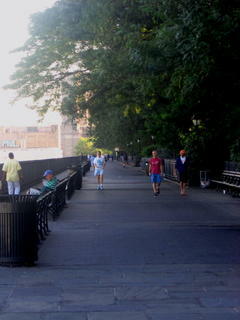 A couple of mornings ago, I rose early and decided to walk on the Promenade before breakfast. As I was returning, I spotted a small cruise ship emerging from behind Governors Island, which lies below the tip of Manhattan, preparing to sail up the Hudson. This vessel has the typically motor yacht-like look of today's cruise ships, but is trimmer and more attractive to my eye than the much larger vessels that now dominate that trade. After getting this photo, I returned to my apartment and was just sitting down for breakfast when I glanced out the window and saw something that made me dash out the door, camera in hand, and back down to the Promenade. Another small cruiser was coming in, but this was a much older vessel, of a type seldom seen here. Note the much more "shipshape" lines of this vessel, which I would guess to be of late 1950's or early '60's vintage. Alas, most of its kind are now gone. Update: I now know she was either Saga Rose or Saga Ruby. This time, it's an Englishman living in semi-retirement in France. I discovered him because Blogger identified us as the only two users of their service with an interest in "ships and the sea". On going to his site, I found we had much else in the way of common interests. His thoughts and poetry can be found at A Layman's Analyses in France. Do I have a particular affinity for blogs by expatriates? Perhaps it's because I was one during several very formative years. I've discovered an excellent blog by an American living in Beijing. A fascinating account of life in that city, with incisive views on the Chinese legal system and reflections on the status of foreigners there, can be found at Two Wheels Bad, Four Wheels Good? John Hartford, in a river song, once described a riverboat as an engine surrounded by someone with a fetish for a scroll saw. He was right. It isn’t unusual to see a new hull built around 75 year old engines. A hull with these beautiful Victorian filigreed scroll sawn gussets on all three decks. Despite my paternal connection to the river, I've not spent enough time along the banks of the O-hi-o (as the old song goes, which I first heard at about age ten on the radio in my parents' Chevy while riding across southern Ohio en route from my mother's home in Pennsylvania to my dad's in Indiana) to see one of the grand old boats steam by. I have seen many a stick of barges pushed by a massive diesel-powered towboat. So, tell me, Rap, or anybody, why is it called a "towboat" if all it does is push, not pull? As the enormity of the tragedy has become apparent, I've felt compelled to add to my earlier, brief comments. However, as so often happens, I find that my Fray friend Demosthenes2 has said pretty much what I would have, but more eloquently, and probably more succinctly, at http://fray.slate.msn.com/?id=3936&m=15634963 . For anyone reading this who's unfamiliar with the Fray (which I've now referred to in two posts, and certainly will again), there's a good description in Wikipedia at http://en.wikipedia.org/wiki/The_Fray_%28Internet_forum%29 , written, I believe, largely by Fray stalwarts Deej and Betty the Crow. I don't mean for this Blog to be a site exclusively for Fraysters. To the contrary, I encourage participation by everyone. If you're unfamiliar with the Fray, or with Slate Magazine, and decide to join in there, too, then so much the better. But, if you don't, that's fine by me, too. One of Massena's fine points is that it's located close to the Eisenhower Lock on the St. Lawrence Seaway. The Seaway is a system of canals, locks and dams that allows ships of up to almost 700' length to traverse the St. Lawrence River and Great Lakes, from the Atlantic to Lake Superior. The Seaway was built in the 1950's, and replaced an older system of smaller locks and narrower, shallower canals that limited navigation to uneconomically small vessels. When completed, the Seaway locks were large enough to accomodate most cargo ships, excepting the largest tankers and bulk carriers. Today, many container ships and bulkers are too large for it, but it still carries an impressive amount of ocean-borne cargo to and from ports ranging from Ogdensburg, New York west to Duluth, Minnesota. An even greater volume consists of cargo carried to and from U.S. and Canadian ports along the Lakes and the St. Lawrence to other such ports. Most of this cargo is carried on "lakers", specialized vessels built for Great Lakes navigation. The classic laker design had the wheelhouse atop a tall superstructure at the bow of the ship, and the engine room and funnel at the stern, leaving a long open deck with cargo hatches between. Recently, lakers have tended toward the arrangement standard for oceangoing freighters of having both the wheelhouse and engine aft. Still, they can usually be distinguished from "salties" by an overall blunter, more bargelike hull shape. Whenever we visit Massena, I get on line and visit the Seaway's web site, which provides a handy map showing the location of ships on the Seaway. From this, I can tell when to drive up to the Eisenhower Lock visitor center, which has a platform overlooking the lock, and see a ship or two locking through. This past Friday, I saw that two ships, one a laker and the other a salty, were due to lock through in the late afternoon. The first through was the Frontenac, of Canada Steamship Lines (note that, despite the company name, this vessel, as almost all now active, is diesel powered), a laker built to the maximum dimesions allowing transit of the Seaway locks. 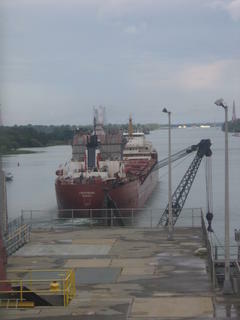 Here is Frontenac entering the lock. You can see the classic, wheelhouse-forward laker design. 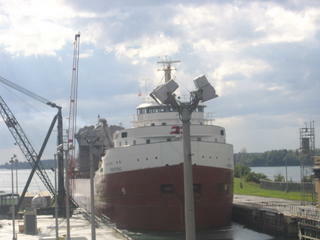 Below is Frontenac in the lock, looking aft from behind her wheelhouse. 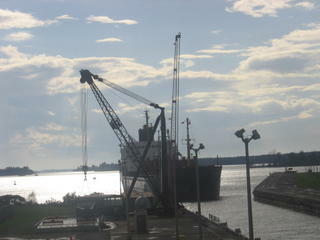 The enormous boom is for unloading cargo (typically grain or pelletized ore) at ports that lack unloading facilities. Finally, we see Frontenac, having locked through, heading downstream toward her home port of Montreal. 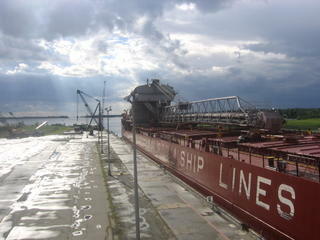 By the time Frontenac was gone, and the lock refilled, the Russian freighter Aleksandr Suvorov was waiting its turn. Here's the Suvorov entering the lock. Unfortunately, after this shot the batteries in my camera expired, preventing me from recording the Russian vessel's progress through the lock. A very tanned, weather-beaten looking man and a woman with coppery red hair were lounging atop the wheelhouse. From the stern, I read Suvorov's hailing port as Murmansk, on Russia's north coast. This explained the logo of a white polar bear emblazoned on the ship's black funnel. Update: For more photos and text about Eisenhower Lock, see here and here. For more about classic lake boats, see here.